The tomb of Catharine of Bourbon, Duchess of Guelders (d. 1469), Stevenskerk, Nijmegen (Netherlands). The most prestigious place for a tomb in a medieval church is in the centre of the choir before the main altar. 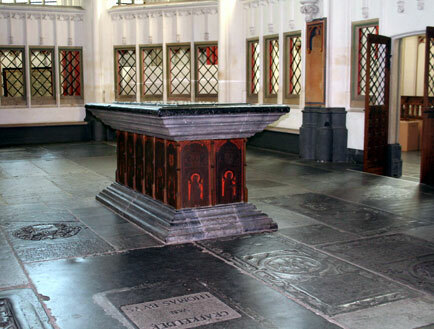 This is where we find the monument to Catharine of Bourbon in the church of St Stephen (Stevenskerk) in Nijmegen (PHOTO 1). From a distance it may seem a rather modest memorial, but a closer look reveals it to be a tomb covered in richly engraved brasses – rare survivals in the Netherlands. Catherine was born into one of the noblest French families in or around 1440. 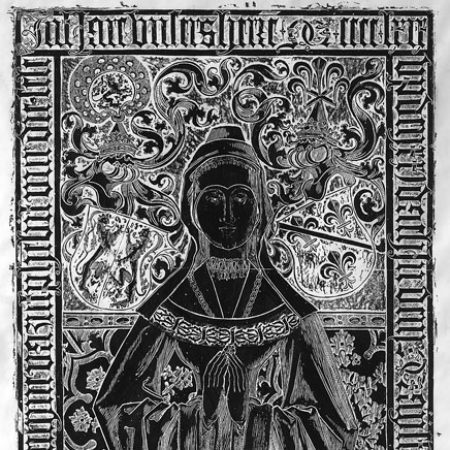 She was thus barely thirty when she died in 1469. Her tomb is some four decades later in date, however. So why did she deserve such a prominent place in the church at Nijmegen and why did it take so long before she was honoured with a monument? The answers to these questions lie in the duchess’s bequests to the church and the political situation in the duchy of Guelders under her husband and their son. Catherine was a daughter of Duke Charles I of Bourbon and Agnes of Burgundy, daughter of John the Fearless, Duke of Burgundy. It was Agnes’s elder brother Philip the Good who arranged matches for her four daughters to suit his own political ends. In 1463 Catherine married Adolf, son of Arnold van Egmond, duke of Guelders, and Catherine of Cleves (another niece of Philip’s). Catherine and Adolf had a daughter, Philippa (1465-1547), and a son, Karel (1467-1538), who was to become the most famous duke of Guelders. Meanwhile Burgundian influence in Guelders continued to grow and with that grew the desire to defend the duchy’s independence. Adolf first sided with Philip the Good and with his mother Catherine of Cleves to overthrow his father Arnold, whom he took prisoner in 1465. However, when Adolf himself then turned against Burgundy the new duke Charles the Bold restored Arnold to power, who promptly mortgaged his duchy to Burgundy and made Charles his heir. Adolf became Charles’s prisoner and his young son Karel was taken away to be educated at the Burgundian court. Yet it was the still captive Adolf whom the states of Guelders recognised as their new duke upon Arnold’s death in 1473. Adolf was liberated after the death of Charles the Bold in 1477, but he died that same year while leading the Flemish troops in the siege of Tournai. Catherine of Bourbon never witnessed these latter events, having died in 1469. It was not until 1492 that her son Karel was able to take over the government of Guelders, but he would be fighting the Habsburgs for power over his duchy until his death in 1538. 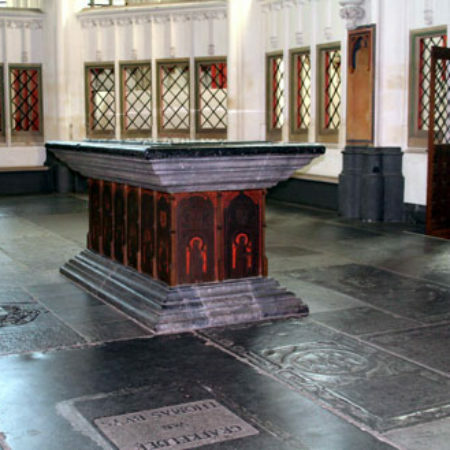 A generous bequest to the church in Nijmegen led to Catherine being buried in the choir as befits a major benefactor: with the money she had bequeathed the Stevenskerk became a collegiate church in 1475. Yet the tomb we see today is really a cenotaph: Catherine’s body rests in a coffin in the specially constructed vault under the church floor, which was intended to house the remains of her husband and son as well. However, Adolf was buried in Tournai while Karel was laid to rest in Arnhem. 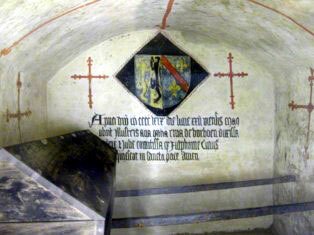 The painted Latin inscription on the wall of the vault gives Catherine’s date as 22 (not 21) May 1469 (PHOTO 3). It may have been his struggles with Burgundy that prevented her husband Adolf to erect a monument over his wife’s last burial place. Her son Karel was not yet two years old when his mother died, so he will have hardly known her. He also had other, more pressing concerns when he finally assumed government of the duchy in 1492, for his position was also far from secure, at least until the death of Philip the Fair (grandson of Charles the Bold) in 1506. Yet erecting a prestigious monument to his mother was both a filial and a political gesture. 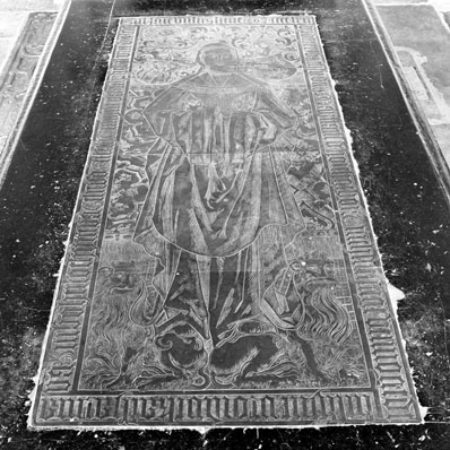 The stone tomb is decorated with seventeen engraved and polychromed brasses, which were commissioned from the engraver Wilhelm Loemans (d. 1512) in Cologne. (Loemans had earlier produced the large memorial brass in Geldern to Karel’s aunt, the regent Catherine, who had died in 1497.) 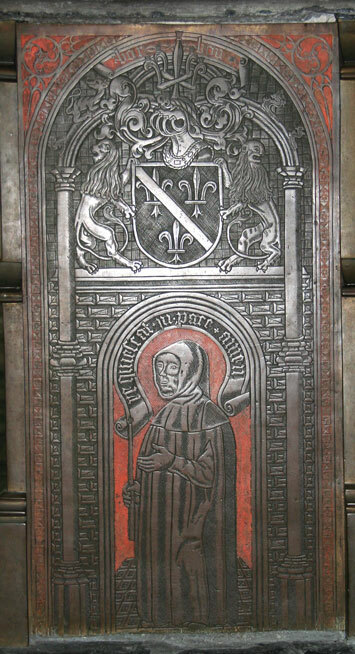 In addition to the large brass on top of the tomb, twelve smaller plates along the sides show the apostles with the Latin text ora pro nobis (pray for us) while four brasses at the head and feet feature ‘weepers’ and the text requiescat in pace amen (may she rest in peace, amen) (PHOTOS 4-5). Above each of these sixteen figures is an ancestrial coat of arms representing Catherine’s high status and ancestry. The tomb thus does not fulfil its usual function of housing the body of the deceased. 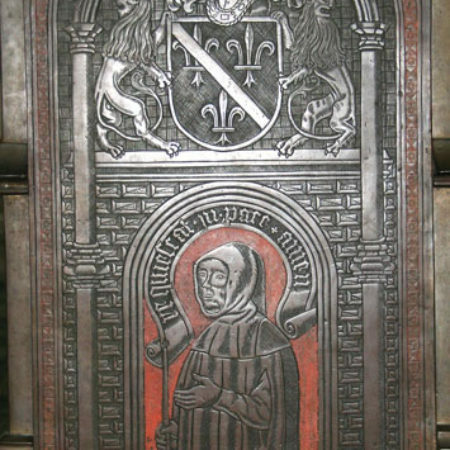 Yet even without a monument during probably forty years after her death, her generous bequest to the church will have ensured the duchess of prayers for her soul by the clergy. The tomb was originally positioned right above the crypt but it was moved slightly westward during the restoration of 1948-1965. 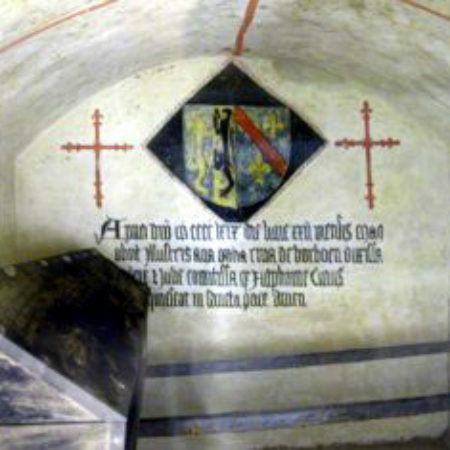 It is also possible to visit the crypt where the duchess’s body still rests. ● More information on the tomb and the vault (in Dutch) by D.J. Dekker at http://www.djdekker.net/stevenskerk/int/tombe.html and http://www.djdekker.net/stevenskerk/int/grafkelder.html.